The sculpture of Theodore Prescott causes you to look and look again at the world you think you see and know—and to recapture your wonder in substance, in the rich materiality of our planet, which sometimes points us toward the transcendent. Because of the wide variety of media the artist employs—everything from found objects to apple burls to salt and rusted steel to the black plastic of truck-bed liners—anyone can gain access to his art. Prescott’s art is highly sophisticated in its engagement with the work of modern masters like Isamu Noguchi and Martin Puryear and yet it is also child-like in its sheer delight in thingness. Prescott has been working as a sculptor for more than forty years and has produced a formidable body of work executed in an astonishing range of materials. Yet throughout this mature artist’s oeuvre there is a beautiful thread of unity: the love of substance and the belief that transcendence can be glimpsed in the grit and heft and sheer materiality of things. In Taste and See (ca. 1997) a hollow is carved in stone and lined with blown glass. The marble container is presented altar-like on a beautifully carved and constructed butternut stand, and the glass-lined hollow is filled with Tupelo honey. When the piece was exhibited many gallery visitors took its title as a command or invitation to literally stick their fingers into the honey and taste it, and as a result the marble became sticky with the glaze left as fingers dripped with golden sweetness. Similarly, in another series of sculptures that Prescott created—the Salt Lick crosses—viewers can see that animals also taste the artist’s work, helping to create the beautiful contours of the inset salt chunks that make up the cruciform shape. In many of Prescott’s works there is a deep sense of cooperation with nature. In more recent pieces the artist has used the naturally extravagant shapes found in the diseased trucks of apple trees (which form a burl or “whorl” resulting from pruning—where human intervention is strangely overcome by nature’s insistence on new and wild growth despite our attempts to “tame” the tree). In these hybrid human/natural forms the artist has sculpted his most mysterious and beautiful work. The series is entitled Small Worlds—and evokes microscopic life forms yet also the cosmic explosions of nebulae, spanning both the invisible world of the microbe and the vastness of interstellar space. In each of these whimsical looking objects there is a feel of otherness––of nature as both funny and threatening. One might not feel entirely safe encountering one of these things suddenly in moonlight or outside the safety of an art gallery. They are both exquisitely beautiful and vaguely ominous like Nature herself. In Straight Line to Heaven Prescott has used the least likely of materials to make allusion to heaven: black plastic truck-bed liner. He uses this surprising material to coat and cover a series of apple tree branches that have been carefully selected, skinned, and painstakingly joined together to make a “straight line” to the ultimate. And again, in a kind of dark uprush, the earthly points toward the ineffable—that same gamble on transcendence. This piece may be the initial artistic inquiry that led to a major commission that is arguably the artist’s finest and most important work to date. In Psalm (a major permanent installation commissioned by Messiah College where Prescott taught for over thirty years) we see the fully developed idea that is hinted in Straight Line. 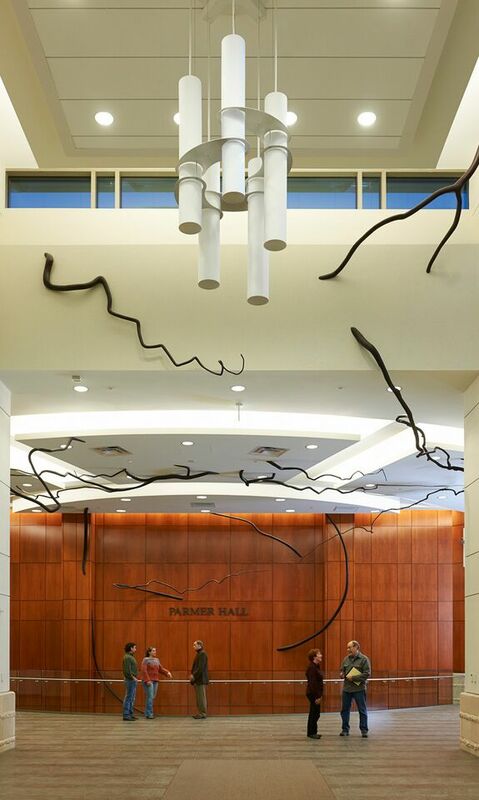 The dark accents of stained apple branches threaded with steel rod interrupt and traverse the clean perfection of the walls and ceilings of the Calvin and Janet High Center for Worship and the Arts. The result is a multivalent spatial vision that echoes the power and shock of the natural world—lightning strikes, root systems irrupting through ceilings and walls, the awesome power behind growing things—in nature and in the heavens. Psalm is constructed from 225 ft. of tree limbs selected out of more than 1500 ft. of apple tree parts harvested from a local orchard that was cleared and plowed under. The selected limbs were individually peeled, seasoned, sanded, stained, and sealed. Each of the over two hundred pieces of apple wood (varying from one to eight feet in length) were dried for one to two years and underwent grinding and carving and careful joinery before being installed in this impressive space. One experiences the installation as both a celebration of movement and a piercing recognition of the finitude and evanescence of human achievement. The pristine postmodern architecture of the High Center is broken and subverted by Prescott’s sculpture even as the space is enlivened and made festive by the same. The title refers both to the biblical poetry of David and also to the music of one of the three movements of A Love Supreme––the magnum opus of the modern-jazz master John Coltrane. Music and movement are always connected. Like the repeat motif of Coltrane’s masterpiece, our heart beats a percussive dah-dah, dah-dah; dah-dah, dah-dah, moment-to-moment giving musical affirmation to the pulse of life itself. And there is unheard music in nature’s growing and twisting and striving toward the light—always seeking the Sun—source of nourishment without which the Earth would become frozen dust. And Prescott’s Psalm sings of this same movement and music. With his love of natural rhythms and materiality Theodore Prescott has yielded a psalm of praise to his Lord—and a life work of impressive scope as evidenced in so many varied and lovingly wrought works. It is not every day that one sees art that makes this crucial connection physically manifest: God with us, incarnate, hymning our very substance with eternal song, moving us upward in a straight line to heaven even as earth is redeemed and made new beneath our feet. 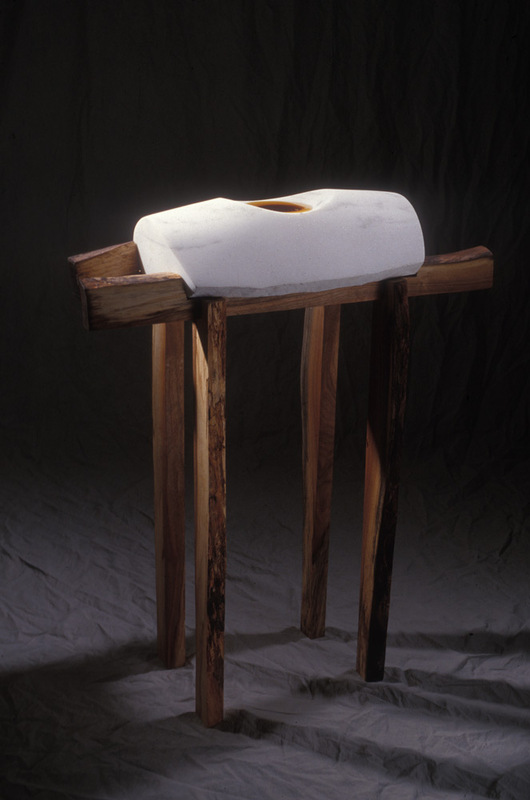 Theodore Prescott: Taste and See, 1997, butternut wood, Colorado marble, hand blown glass, Tupelo Honey, 26” x 11.5”x34.5”. 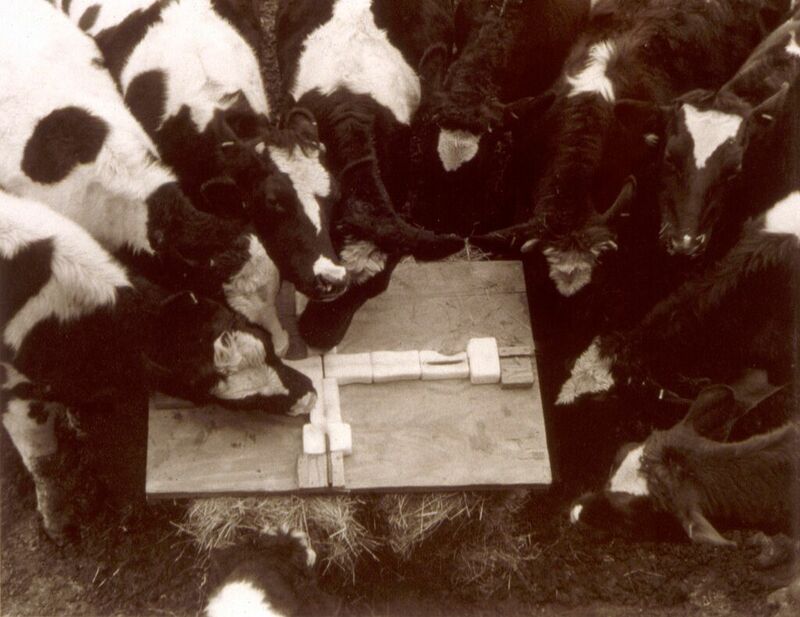 Theodore Prescott: Cows licking early cross, 1991. 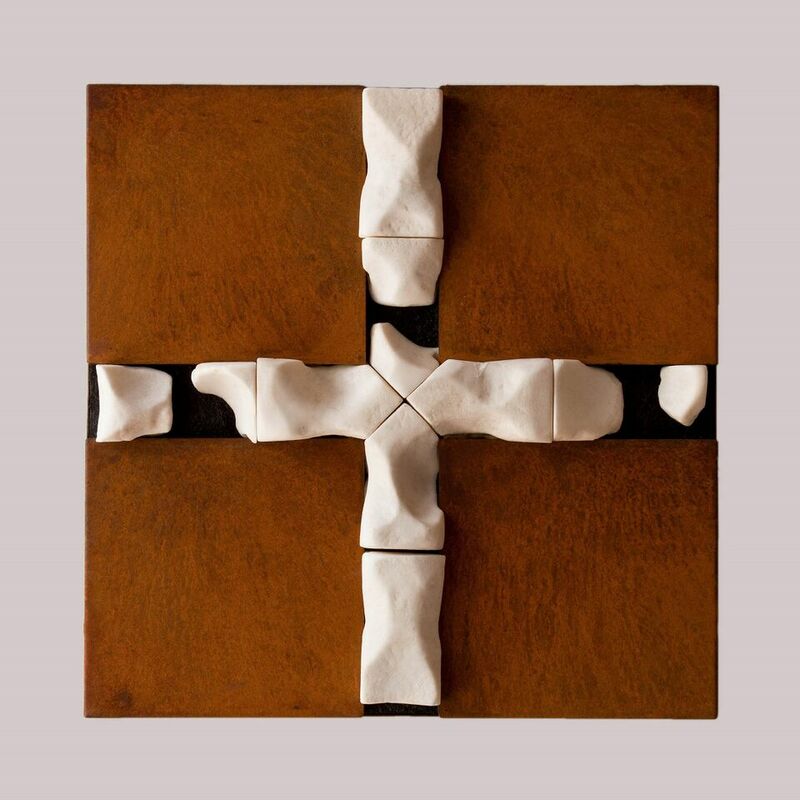 Theodore Prescott: Greek salt Lick, 2011, salt, tar, low-carbon steel, 29” x 29”. Theodore Prescott: Small worlds, 2013, apple whorls and suckers over poplar on Corian and oak tables, spheres with circumference 13”, 18”, 66” respectively—15 lineal ft. across. Theodore Prescott: Straight Line to Heaven, 2008, apple-wood and polyurethane truck-bed liner; 20ft. x 16” x 16”. 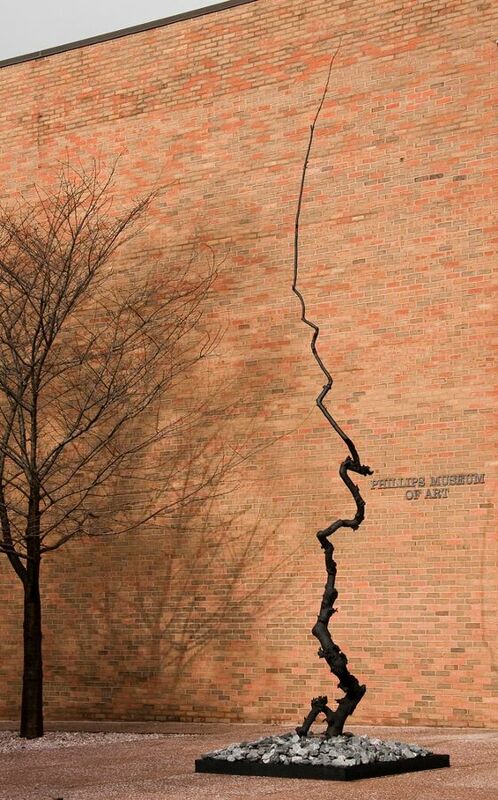 Theodore Prescott: Psalm, 2013, apple and steel, 225 lineal feet. Commissioned installation for Messiah College. Theodore Prescott is a sculptor and writer who lives near Harrisburg PA, USA. In 1980 Prescott began the art major at Messiah College in Grantham, PA. He chaired the art program for a decade, and was the recipient of two successive terms as a Distinguished Professor of Art. He is an Emeritus Professor of Art at the college. Prescott was one of the founders of the national organization CIVA (Christians in the Visual Arts), served as its third president, and edited its triennial publication for more than a decade. He created the presentation box for the CIVA Florence Portfolio, which is in several public collections, including the Vatican Museum. He has also made several public commissions. The most recent was for Biola University, which was completed in the spring of 2015. His work can be seen at www.tedprescottsculpture.com. Bruce Herman is a painter and educator living and working in Gloucester, Massachusetts, USA. Herman holds the Lothlórien Distinguished Chair in Fine Arts at Gordon College where he has taught and curated exhibitions since 1984. He completed both undergraduate and graduate fine arts degrees at Boston University College of Fine Arts. Herman lectures widely and has had work published in many books, journals, and popular magazines––most recently in Through Your Eyes (Wm. B. Eerdman Books). His artwork has been exhibited in many solo and group exhibitions, nationally and internationally. Herman’s art is featured in many public and private collections including the Vatican Museum of Modern Religious Art in Rome; The Cincinnati Museum of Fine Arts; DeCordova Museum in Lincoln, Massachusetts; the Hammer Museum, Grunwald Print Collection, Los Angeles; the Cape Ann Museum, and in many university galleries throughout the United States and Canada.